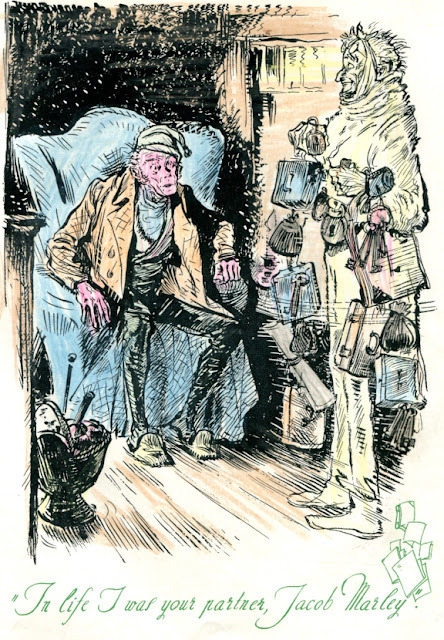 A few days ago a guest on BBC Three’s morning programme said that it had become a lifelong habit to read A Christmas Carol by Charles Dickens at this time of the year to get him into the Christmas mood. 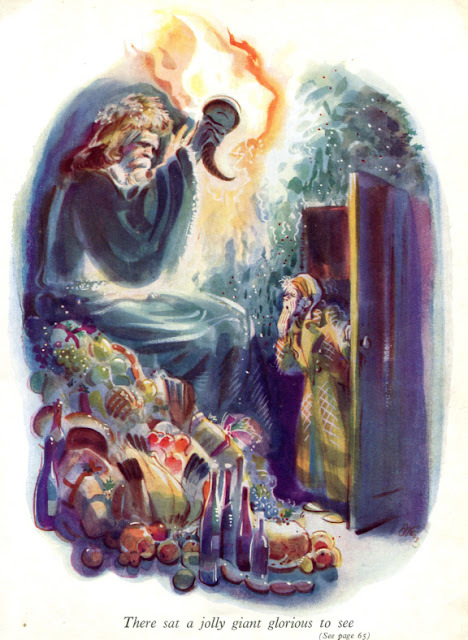 The opening few sentences of the book were read – ‘Marley was dead: to begin with.’ – and immediately, in my mind’s eye, I saw my own childhood copy of the book, almost A4 in size with rubbed, faded red boards and, inside, the wonderful full-size illustrations by Emil Weiss (two of these below). As I listened I remembered how I, too, used to read the book each year as a pre-Christmas treat, saving it for this special time. I rather liked the two Ghosts, Past and Present, who seemed very jolly, sympathetic fellows, but the Phantom of the Fourth Stave frightened me and the scene described as ‘a den of infamous report, with a low-browed beetling shop’ is still vivid in my mind – as are its owner, the laundress, the charwoman and the undertaker’s man. I have the book beside me now as I write and, whilst I was looking for it, I found another book I used to read in the same spirit. This is Christmas at Nettleford by Malcolm Saville. The first chapter is titled ‘Home Again’ and thirteen year-old Elizabeth Ann Langton wakes up in her dormitory bed on the last day of the Christmas term thinking of going home to a ‘large vicarage in a small country town.’ Such a satisfying read, with the Wise Owl bookshop – well, there would have to be a bookshop, wouldn’t there? – its two gangs, the Owlers and the Red Handers (who become friends at the end), the discovery of a valuable antique, which disappears and then turns up again offered as a present at the crib by Elizabeth’s well-meaning small brother during the nativity play – and snow in all the right places! I loved it. Looking along the shelves I discovered other books my clever, intuitive mother had found for me to read all those years ago: wonderfully strange books, apart from the usual classics. I wonder who can remember Hilda Van Stockum’s Pegeen, Mary Maple Dodge’s Hans Brinker and the Silver Skates. Kate Seredy’s The Good Master. Winifred Letts’ Naughty Sophia. John Masefield’s The Midnight Folk. This last I first heard serialised on the BBC’s Children’s Hour. It’s theme music was taken from Stravinsky’s Firebird Suite and even now each time I hear it I am back in the past, crouched by the big radiogram waiting to hear more about Kay Harker and his friends, Nibbins the cat and Bitem the fox, and the scary witch Mrs Pouncer with her sneaky familiars, Greymalkin and Blackmalkin. I have no doubt that all these books, along with many, many others, have influenced my writing, and I thank all those writers who brought such magic to my childhood. Much more than that, the books became my friends; there for me when times were sad or bad or happy. I’d like to thank you, too, for reading the books that I write, for sending such generous, heart-warming emails to me and for the beautiful Christmas cards. May I wish you all a blessed, peaceful Christmas and say – along with Tiny Tim – and Uncle Theo – ‘God bless us, every one’.